Inspired by the sea, the sparkling abundance in this exclusive Matrinus design offers twenty exquisite diamonds along an eternity band. 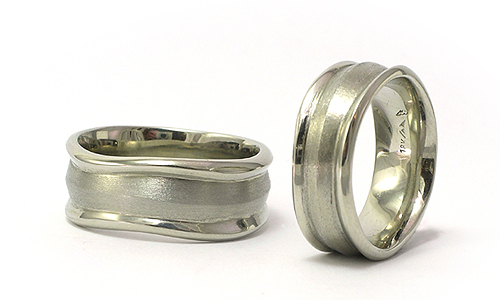 European craftsmanship in 18 karat white gold. Twenty diamonds, 1.04ct F/vvs. A continuum of delicate leaflets reflect and honor the truth in life’s deeper meanings. Seven fine diamonds sparkle like fresh dew drops between elegantly polished side bands and rounded, polished interior. Diamonds F/vs, 0.10ct. 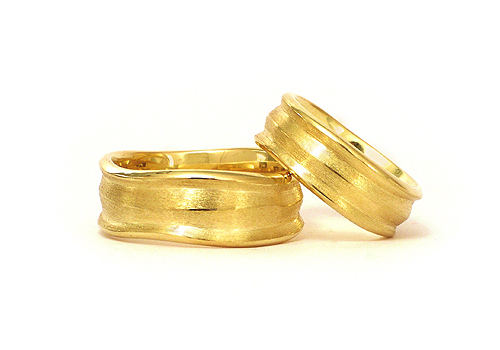 18 karat yellow or white gold. 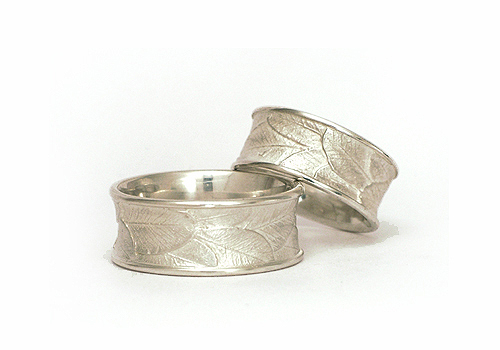 The twigs and twines of nature are the inspiration for this unique ring design. 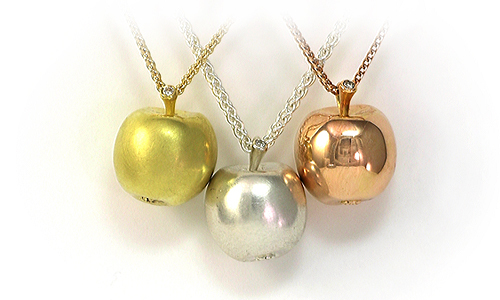 Combining white diamonds with the matte surfaces of rose, white or yellow 18 karat gold. 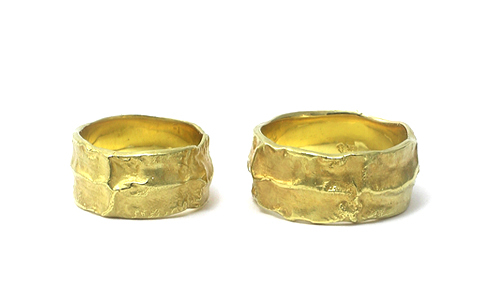 Worn together or individually. Diamonds, 0.06ct. The playful elegance of seven fine diamonds in natural colours are harmonized with bright, gold tones in Martinus West Coast style rings. 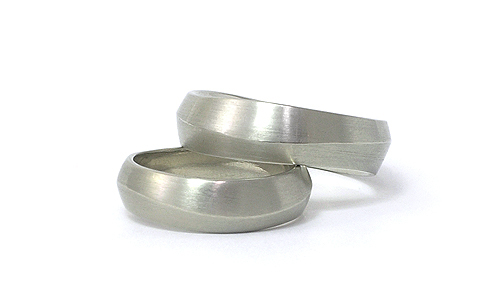 Designed with a comfort fit band, inspired by the shimmering seas. 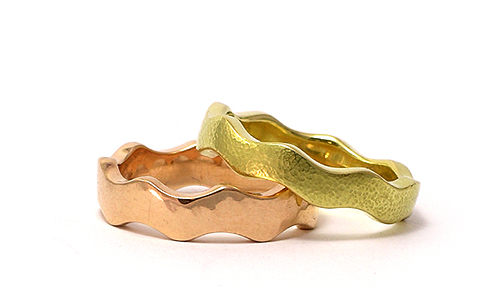 Individual rings available in white, yellow or rose gold. Discover nature in masculine roots and knotty branches. 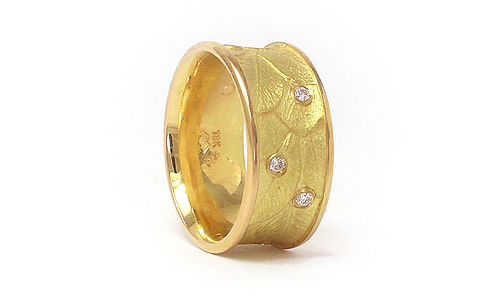 The great outdoors is the inspiration for this unique ring design, combining white diamonds with the matte surfaces of rose, white or yellow gold in 18 karat. Diamonds 0.09ct F/vs. 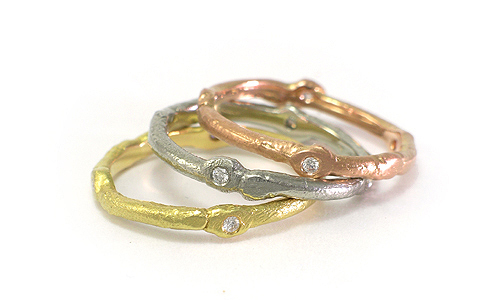 A colony of diamonds takes center stage on your hand. 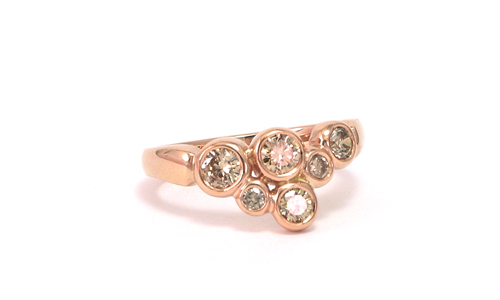 Martinus’ design enlivens varying sizes of fine rosy natural diamonds within low settings to snuggle on your finger. 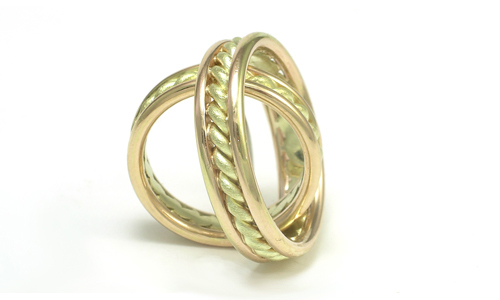 A comfortably rounded ring band in polished rose gold finishes off a new masterpiece in Martinus’ jewelry fabrication. 18 karat rose gold. Natural peach champagne diamonds, 0.64ct. 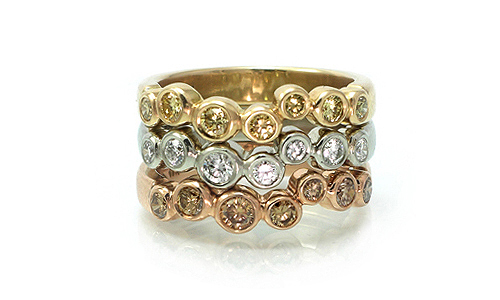 In a hue of peach champagne, sixteen brilliant cut diamonds of varying weights give shape to your finger. With more than one and a half carat stone weight, the natural colour of its diamonds together with the polished rose gold, blend so perfectly in this ring. 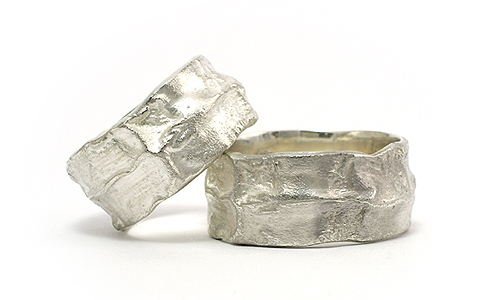 Enjoy authentic craftsmanship and this milestone from the family of Martinus’ signature Barnacles designs. 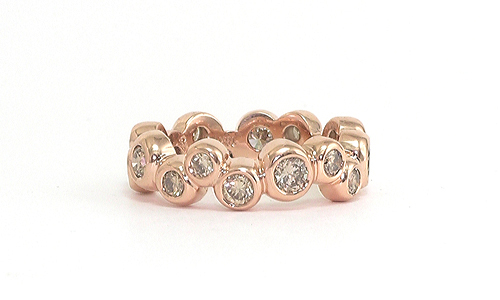 18 karat rose gold, 16 peach champagne diamonds 1.57ct. 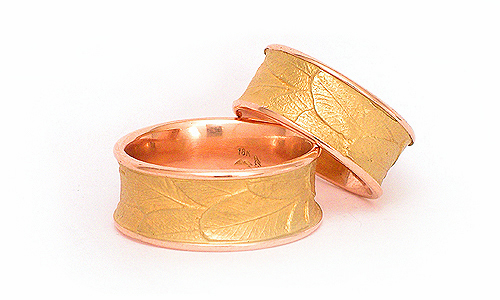 A jeweler’s impressionist view on nature. Seven naturally yellow diamonds of varying sizes have found their rock solid setting. 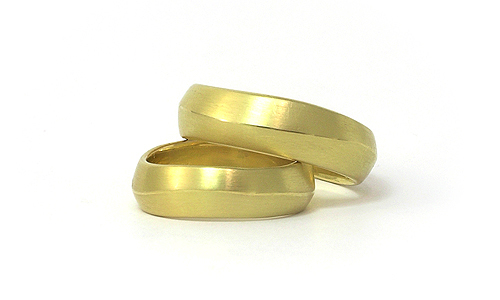 Martinus’ new design in hammer textured yellow gold is composed for absolute simplicity and comfort. 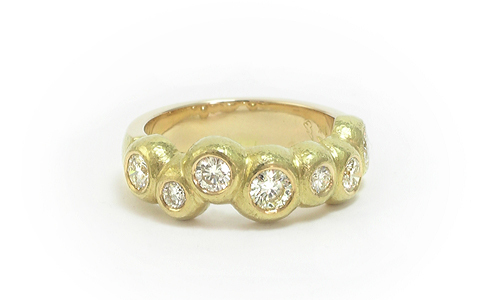 Yellow gold, natural light yellow diamonds, Si 0.80ct. Shining abundance like grace in time, Martinus’ new design in polished white gold is composed of seven varying diamond sizes. 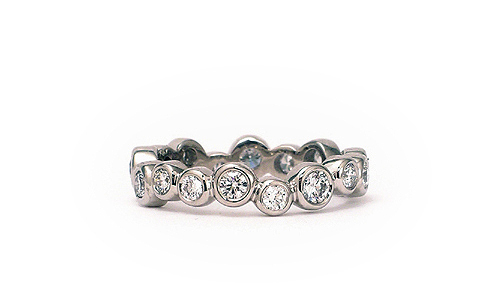 The fine line of quality gems is set in absolute simplicity on a ring of gentle shapes to comfort and to last forever. 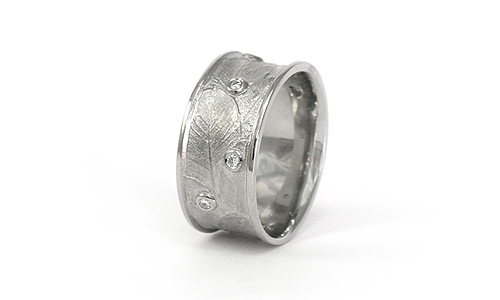 18 karat white gold diamonds F/vs 0.74 ct.
Martinus' continuum of delicate leaflets honours nature in its finer dimensions. 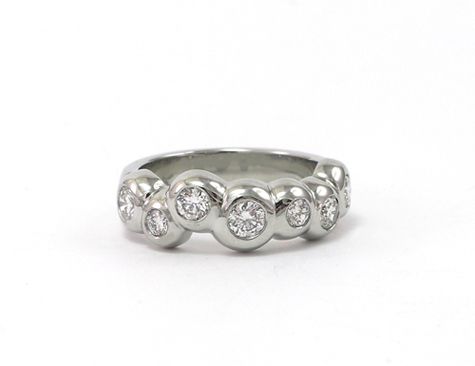 The polished white gold side bands compliment this detailed surface pattern, while seven fine diamonds at random distances sparkle like dew drops in the morning.Enjoy this comfort fit band of solid 18 karat white gold, 7 diamonds together 0.10ct F/vs.